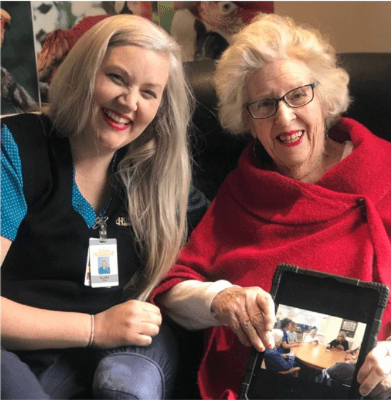 Lifestyle Manager, Alana O’Keefe, thought that there must be a better way for dementia residents to keep in touch with loved ones living remotely. She did some research and a number of possible projects were thrown around, but none were a great fit for set up and ongoing resources or cost. One day Alana,watched a dementia resident struggle with a phone call, confused by a voice at the other end. It was then she thought, what if we could trial Skype and residents could see and speak to family members, the connection would make more sense. Around the same time, Julie Gray the Clinical Services Manager, was contacted by Dementia Training Australia asking if she would be interested in undertaking a research project of her choice. The timing was perfect and meant to be. It was then all systems go for the Dementia Skype Research Project. Having said that, there was still a lot of work to do before the actual skyping could begin. Data was collected for instance on how long an average phone call was for the dementia residents, permission forms were needed to be completed and families were chosen based on who didn’t live locally. Residents were selected based on their communication and cognitive skills. The year long research project kicked off in April 2017 with 6 residents and their families participating, but it was clear by 6 months from the data collected and reports written, that the program was an outstanding success. Much of the program needed to be trialled out of hours to fit in with families’ commitments and Alana was fully committed to this. Initially staff facilitated the Skype sessions, but as time went on with more session’s, staff could step out of the picture once the Skype connection was made. Residents would communicate with their families without assistance and importantly could sit still and concentrate for around an average of a 10 minute conversation. The Skype Dementia Program had such a positive impact, not only for the dementia residents but also for staff, because they learnt more about the resident and could see the bigger picture on how they lived before from their conversations. A Skype session would often promote further a conversation with a staff member about a memory or incident from a time long ago. There were happy tears from staff when one resident was shown their newborn great grandchild and she reached out and touched the screen trying to pat the newborn baby. Long since Julie finished and submitted her report to Dementia Training Australia, the Program has continued to make a positive impact on the residents. Julie has since been contacted by the Universities of Wollongong and Tasmania, as well as Dementia Australia, on how to successfully run a program like this. Thank you and well done to Alana for all your hard work in getting this program up and running, and to Julie who wrote and submitted the final report to Dementia Training Australia. We are so proud of you both for working so hard on this project which has been an outstanding success and role model to other institutions, wishing to pursue Skype as a means to keep their dementia residents connected to their loved ones living far away. If you would like to know more about the Dementia Skype Project please Contact Julie Gray, our clinical Services Manager at our Sea View Manor Residence here.